Choose from 2 table and 3 table gift sets, select 1 design or 4 designs for your cover. 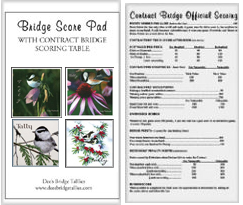 Matching score pads with Contract Bridge Official Scoring information on the inside cover (shown at right). TALLY is printed on the tallies but not on the score pad designs. The 40 page score pads measure 4" by 7".